Even smart kids do stupid things. It’s a simple fact of life. 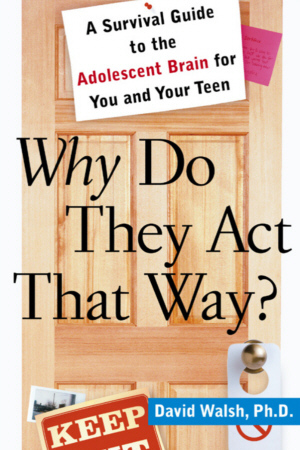 No one makes it through the teenage years unscathed-not the teens and not their parents. But now there’s expert help for both generations in this groundbreaking new guide for surviving the drama of adolescence. In WHY DO THEY ACT THAT WAY? nationally renowned, award-winning psychologist Dr. David Walsh explains exactly what happens to the human brain on the path from childhood into adolescence and adulthood. Revealing the latest scientific findings in easy-to-understand terms, Dr. Walsh shows why moodiness, quickness to anger and to take risks, miscommunication, fatigue, territoriality, and other familiar teenage behavior problems are so common-all are linked to physical changes and growth in the adolescent brain.